Background: Gentianella acuta (Michx.) Hulten is an important type of medicinal plant found in several Chinese provinces. It has been widely used in folk medicine to treat various illnesses. However, there is not enough detailed information about the chemical constituents of this plant or methods for their content determination. Objective: The focus of this work is the isolation and characterization of the major chemical constituents of Gentianella acuta, and developing an analytical method for their determination. Methods: The components of Gentianella acuta were isolated using (1) ethanol extraction and adsorption on macroporous resin. 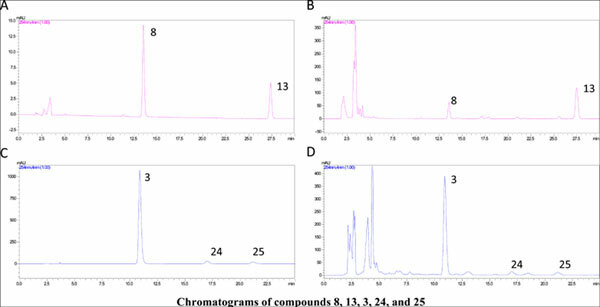 (2) and ethyl acetate extraction and high speed countercurrent chromatography. A HPLC-DAD method was developed using a C18 column and water-acetonitrile as the mobile phase. Based on compound polarities, both isocratic and gradient elution methods were developed. Results: A total of 29 compounds were isolated from this plant, of which 17 compounds were isolated from this genus for the first time. The main components in this plant were found to be xanthones. The HPLC-DAD method was developed and validated for their determination, and found to show good sensitivity and reliability. Conclusion: The results of this work add to the limited body of work available on this important medicinal plant. The findings will be useful for further investigation and development of Gentianella acuta for its valuable medicinal properties. Content determination, Gentianella acuta (Michx.) Hulten, HPLC analysis, isolation, medicinal plants, traditional medicine.